An electric Golf joins the E-Up, but Volkswagen is still conservative when it comes to sales projections. Last year, the House of Volkswagen began to tinker with electric. This year, the interest is picking up a bit. Dr. Martin Winterkorn -- the CEO of the conglomerate that makes Volkswagens, Audis, Lamborghinis and Skodas, among other cars -- came to Palo Alto this week and told many publications that Volkswagen will play a key role in electrified driving. The conglomerate in 2009 also hired Tesla co-founder Martin Eberhard (reported here first). But the group isn't going overboard. Last September at the Frankfurt Auto Show, the group showed off an all-electric Audi for 2012 and an all-electric Volkswagen, called the E-Up, for 2013. Volkswagen executives said that all-electrics might constitute 1.5 percent to 2 percent of its sales by 2020. A few months later, the company began to show off a Touareg hybrid for 2011. 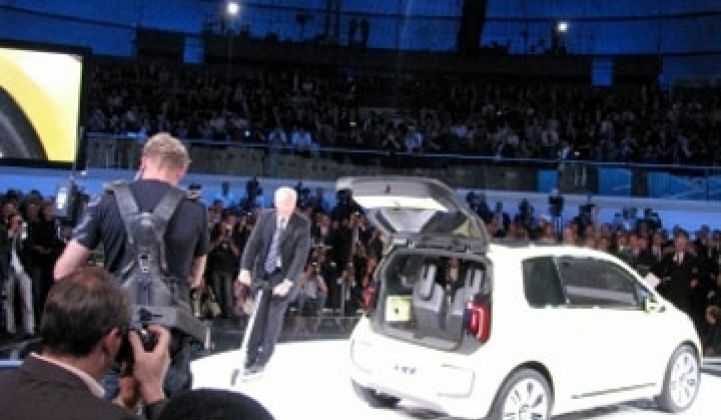 The accompanying photo shows an E-Up with Ulrich Hackenborn driving the electric scooter that will come in the trunk. Winterkorn this week said that Volkswagen might also come out with an electric version of the Golf in 2013, thus adding another car to the lineup. He also added that hybrids and electrics might constitute 3 percent of sales by 2018. This could be a slight increase or decrease depending on how you count the hybrids. Either way, it puts Volkswagen on the low end of the market. Nissan-Renault has said ten percent of its cars will be all electric by 2020. Ford has said 25 percent of its cars will be hybrids, plug-in hybrids or all-electrics by 2020, with the vast majority of that total being hybrids. In all likelihood, Volkswagen's heart will remain with diesel and clean diesel. Last year, the company sold out of diesel Audis and Volkswagens in the U.S. "We think that diesel could grow to around 15 percent of the [U.S.] market," Johan de Nysschen, president of Audi of America, told us in the fall of 2009. Historical note: Dr. Ferdinand Porsche built the first hybrid in 1902 and Porsche became part of Volkswagen last year.